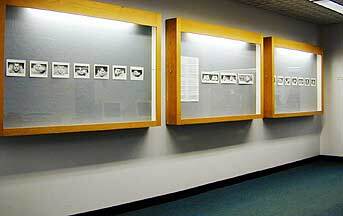 The photograph above is one of the latest examples from a "body of work" that started in the mid-1960s using film cameras. This is a peripheral, or "roll-out", portrait made at a local fair with an improvised scanning digital camera made from a simple Kye hand-scanner. The linear array imaging element was removed from the scanner and installed in the back of an old Minolta SRT101. A cable was constructed to reestablish the connection between the array and the scanner itself. Since the scanner body was not required to actually move over a subject, the motion of the roller driven chopper wheel that informs the scanner software how fast its is moving over copy, was replaced with an LED driven by a variable frequency oscillator. Its frequency was adjusted to give the desired aspect ratio to the final image of a subject rotating in front of the camera while standing on a turntable. I have a collection of about 40 small (about 5x7 inch (125x175 mm) inkjet prints of this on-going portrait photography project. If you would like to host and hold an exhibit of them at your location I would be happy to place you on the exhibition's itinerary. This is designed to be a "low-stress" project aimed at sharing images and ideas!. July 2001 - Lancaster, CA - host: Marilyn Dalrymple - push for story. August 2001 - Guaymas, Sonora, Mexico - host: Alberto Tirado - push for story. October/November 2001 - Lima, Peru - host: Luis Miyashiro - push for story. November 2001 - University of Chicago - host: Liese Ricketts - push for story. 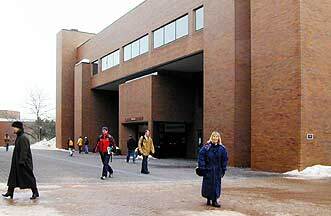 January 2002 - Clemson University, Clemson, SC - host: Sam Wang - push for story. February 2002 - Cardinal Gibbons High School in Raleigh, NC - host: Martha Walton - push for story. March 2002 - Stephen F. Austin State University - Nacogdoches, TX, host: Amy Holmes George - push for story. March 2002 - The Pan American Christian Academy, Sao Paulo, Brazil - host: Mario DeMarchi - push for story. April - May 2002 - Buenos Aires, Argentina - host: Becquer Casaballe - push for story. April - May 2002 - Panama - host: Carlos Guardia - push for story. November 2002 - Clark Atlanta University, Atlanta - host: Prof. Belinda Peters - push for story. December 2002 - MIT Media Lab - host: Sam Hill - push for story. January 2003 - Greenfield High School, Wisconsin - host: Judy Grochowski - push for story. 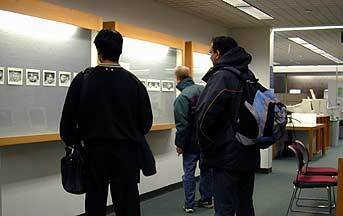 February 2004 - RIT's Wallace Memorial Library Push the green buttons for a view of the exhibit . The photographs continue to be available to any interested party but the truth is that I have not promoted their availability in recent years as much as I did in the beginning!